Spring is always a wonderful time around here. The winter is so gray and when the first flowers start to show it makes everything seem so alive. 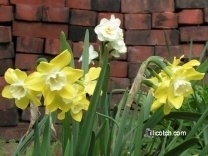 I plant many different kinds of spring bulbs that multiply each year so the flowers come early and in several waves.